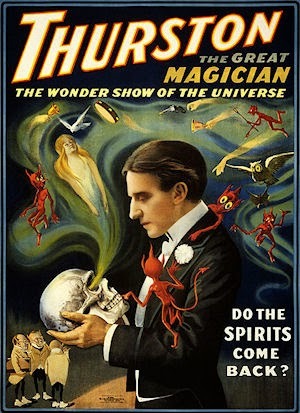 A century ago, Howard Thurston (1869-1936) introduced audiences to magic tricks that seem cliché today: He became famous by sawing women in half, making cards rise unassisted from their decks, pulling rabbits from audience member's coats, and levitating assistants far above the stage. Before big names like David Blaine, or even Harry Houdini, Howard Thurston was the world's greatest magician. A new exhibit at the Morbid Anatomy Museum in Brooklyn sets the story straight with a look at Thurston's pioneering legacy and the otherworldly allure of his magic shows.